If you haven't gotten yourself a grown-up coloring book yet, you really need to do so! It's a lot of fun and we all need some free time to take our minds off weighty things and focus on a simple and enjoyable artistic undertaking. 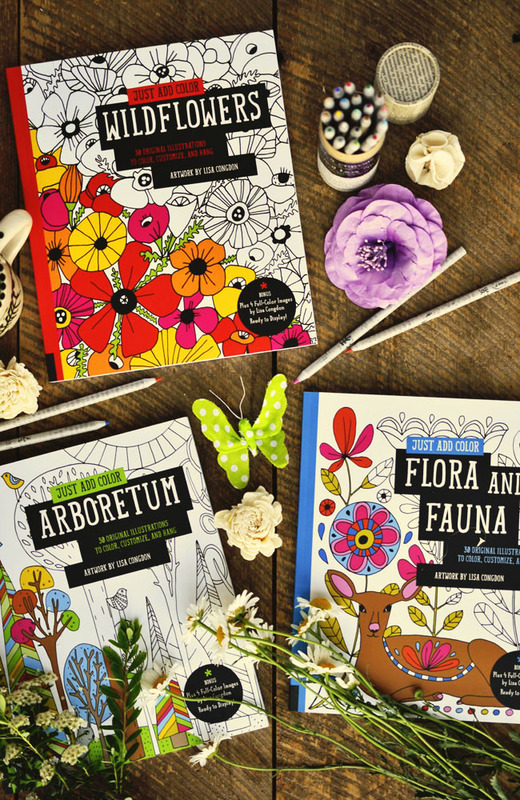 These three books, part of Quarto Publishing Group's Just Add Color series, are particularly beautiful. 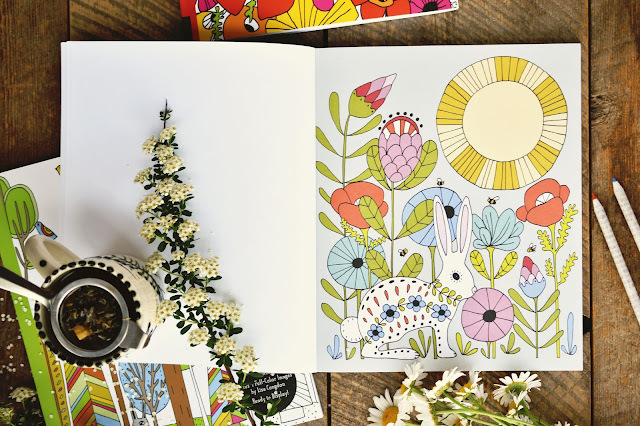 They are illustrated by Lisa Congdon, an accomplished illustrator and fine artist. I see these lovely coloring books going along on excursions to beach, cottage and park this summer. 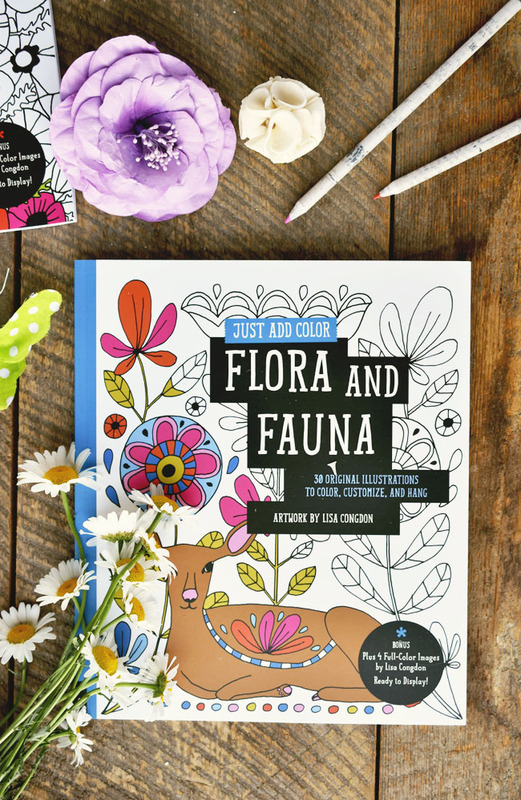 If I had to pick, I'd say Just Add Color: Flora and Fauna is my fave of the three books, because it has more animals in among the foliage. Then again, Aboretum has some animal friends too. And I do love me some Wildflowers. Oh, I don't know - they are all beautiful! Each book has 30 original designs from Lisa Congdon, with 72 perforated pages to make it easy to remove and hang your artwork. Each of these coloring books also has four bonus designs already colored in by the author. I think they would be amazing framed in a kid's bedroom or in a home office. 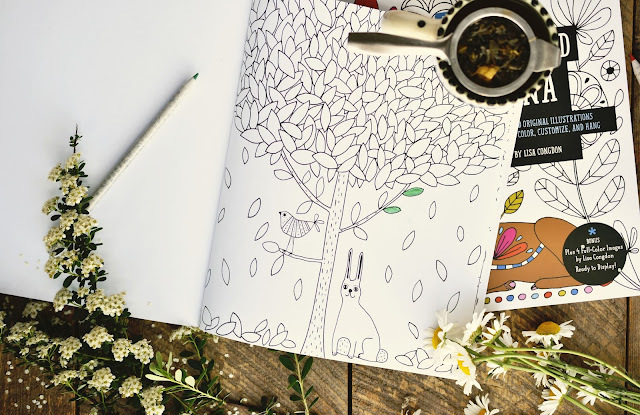 Also celebrating nature, Just Add Color: Arboretum pays homage to our friend the tree, with a few birds and rabbits enjoying their leafy homes as well. I feel like these designs have just enough complexity to make them interesting, without an overwhelming number of small nooks and crannies to color in. 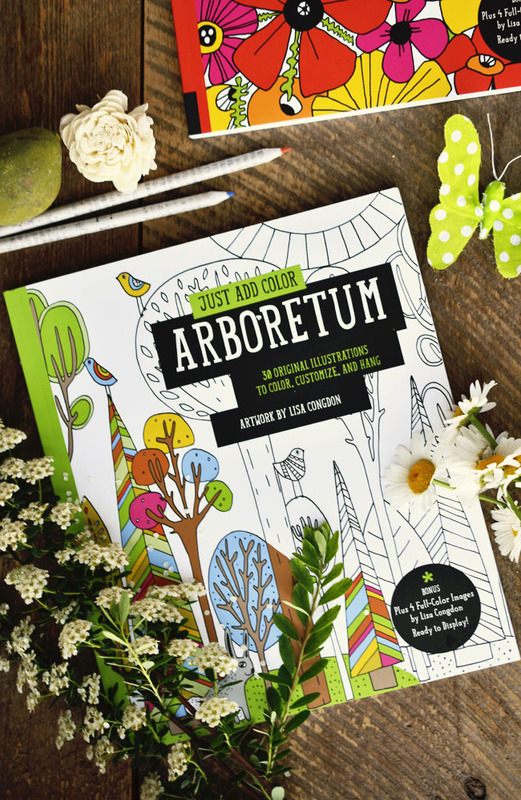 Above, a coloring page from Arboretum. I grew up loving wildflowers because they were all over our lawn at the cottage. I especially like any flowers that are purple or sunny yellow. 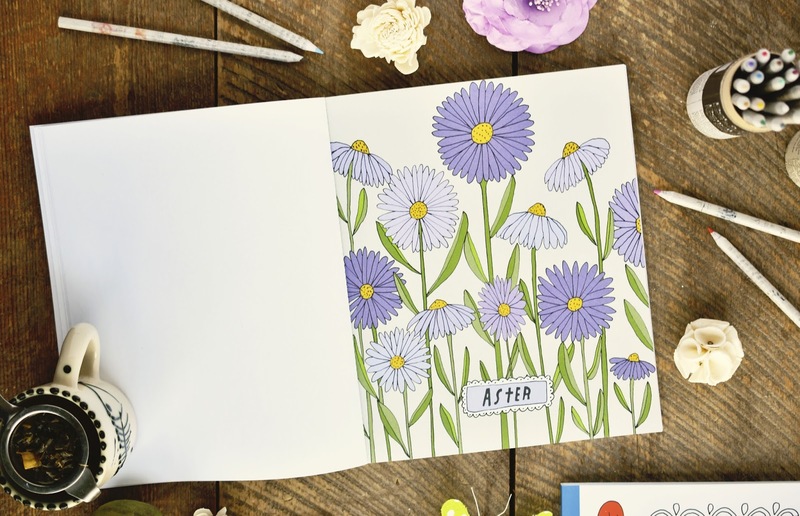 Just Add Color: Wildflowers: 30 Original Illustrations to Color, Customize, and Hang features many gorgeous flowers, each of them named in the illustration. The author has provided four colored pages, including this gorgeous page of asters, above, for us to display. You can also color in your own page of asters, using this page as inspiration or doing something entirely different. I don't think art needs to be accurate to real life, do you? How do you like to spend your alone time? 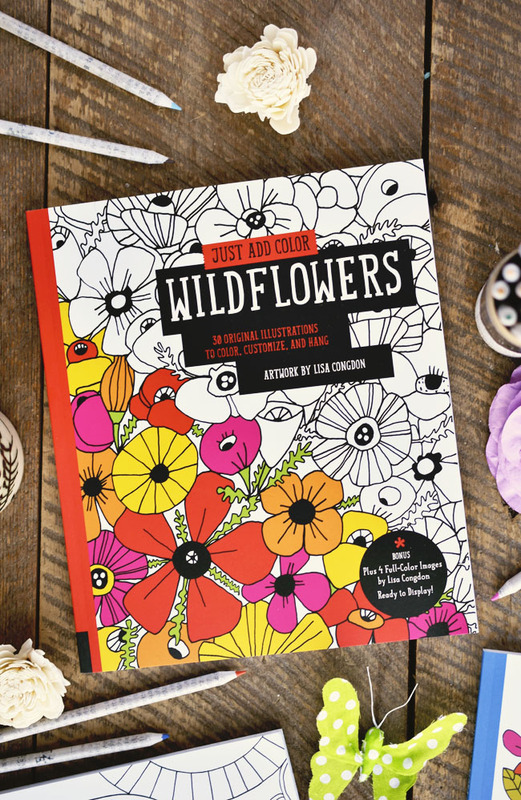 Just Add Color Book Giveaway! 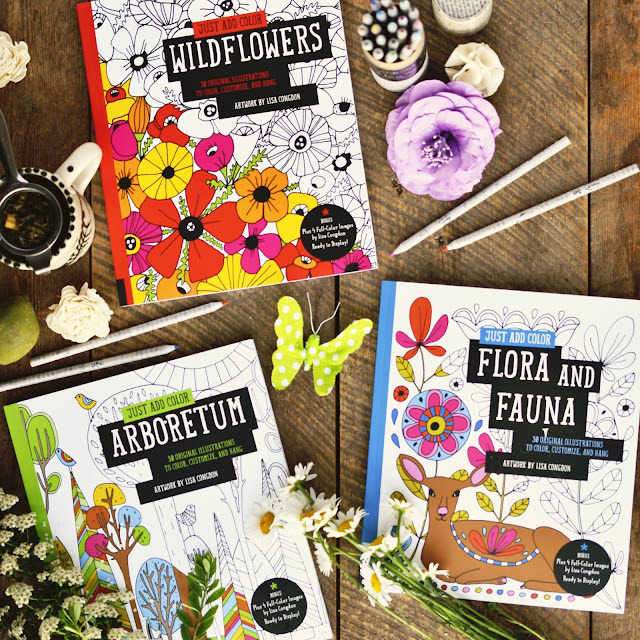 Quarto/Rockport Publishers has kindly offered to give one lucky Woman in Real Life reader all three of these gorgeous Just Add Color coloring books in celebration of our blogiversary! Residents of the US and Canada may enter using the rafflecopter below until July 18th. *I was provided with books for review purposes. This post contains affiliate links. I like to watch TV, read and color! Watching tv shows, entering contests. My alone time consists of yoga, sitting in my massage chair, gardening, reading, colouring (I love colouring), meditating and long fast walks with music to keep me going. I love these books because the things to colour are not so tiny. Sweet. I love to read. I plan my relaxing and alone time to a tee. I like to read, and I like to cook and bake. I like to read.....recently tried some coloring with my girl. I love reading and, of course!, coloring! I like to do yoga or read in my alone time. I love reading, colouring and sewing! Great giveaway. It's a pleasure to meet you. Happy blog anniversary. I enjoy designing blogs, designing graphics, some cards and coordinate pretty tablescapes. Reading during the summer month. I would love to invite you to share some of your posts at our link party every Sunday, Dishing It & Digging It....no link parties or giveaways, but fun posts are always welcome. We have some ladies who love vintage. Happy weekend. I like to just sit down and relax with a coffee. I haven`t tried adult coloring,sounds relaxing and fun! I spend my time surfing the net. I like to read (and nap!). i like to sit out side in the morning with my coffee watching and listening to the birds and coloring in the evening. I usually just catch up on trashy reality TV with a big bowl of popcorn or watch something on Netflix. I like to watch TV, cook or bake. I like to take bubble baths and do my own facials when alone. I get very little alone time (especially in the summer) so currently I relax to Netflix (Supernatural is my current addiction). Wine and a good book either on the patio or in a bubble bath! Thanks so much for the chance to win, I also love colouring! I don't really have any, three little kids with twins on the way I'm pretty surrounded all day everyday. I love to read, colour or listen to music in my spare time. I usually read but think I would enjoy colouring!